16 year old Jewalle Samone Papadoupalos-Wright better known as Jewalle P was born in Charlotte, North Carolina to the parents of Michael Papadoupalos and Christina Wright, with the ethnic background of Greek and African American. 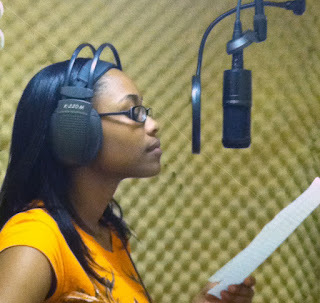 Jewalle P is one of the future rising stars of R&B/Pop and Gospel singer/songwriter. Some people were made to become stars but in this case Jewalle P was born to be a star. Jewalle P gift of being a singer was discovered at the tender age of 9 yrs old and soon after became a part of the “Libby Stone” model and talent agency. Her talent for songwriting came at the age of 13. Jewalle P had the opportunity to be a part of the most known production studios “Creative Edge” that was future on Fox news. This is where Jewalle P at 11 years old begin competing in several talent shows and reaching the final rounds. Music is a big part of Jewalle P, but above music she places GOD and her love for education first. One of her mottos in life came from a song called “To Fly”…”I came to win, to fight, conquer, to thrive. I came to win, to survive to prosper, to rise, to fly”…..
At 13 Jewalle P was the first and the youngest to make it through the audition for a musical and main stage singer for Charlotte’s elite professional choir “Carolina Voices”, Soon after she was invited to be a guess on one of the hottest radio station in Charlotte “Power 98” where she had the pleasure of singing on air. Since then Jewalle P has been a part of many productions and plays. Jewalle P ultimate goal is to flow her dreams of becoming a singer and work being able to work with Tyler Perry movie/play writer. 3375 Where did you grow up? 3375 What sort of things influenced you as a musician growing up? Jewalle I have always listened to a lot of Gospel and R & B, both of which have definitely influenced my singing. 3375 What is your background with music? Jewalle I started singing at 9, while listening to my grandmother sing I became interested in writing my own music. 3375 Do you play any instruments in particular? 3375 Are there any significant events/people that have gotten you to where you are as a musician today? Jewalle Yes. There are quite a few people who have contributed to my growth as an artist, my mother, god-father, family and my community being the biggest supporters... I have had the opportunity to sing at weddings, church functions and much more. 3375 What is your process for writing music from the inspiration to creation? Jewalle I like to find a quiet area in the house or under a tree on a nice sunny day and brain storm ideas. Sometimes I’ll listen to the rain drops fall and the words will begin to flow through my pen and onto the paper. Other times I will listen to an instrumental, choose the instrument that fits my mood and write to it. 3375 What artists/styles of music influence your music the most? Jewalle To name a few: Mary J. Blidge, Whitney Houston, Alicia Keys and Michael Jackson. 3375 Are you working on any new material at the moment? Jewalle Yes. I am working on my first official single to be released soon. 3375 What is your biggest struggle in the music scene being at such a young age still? Any advantages? Jewalle I think the most difficult struggle I face as an artist is to be different. Think outside the box in terms of creativity, not conform to what other artist are doing to become popular... stay humble overcome through discipline, dedication and devotion to my passion while delivering inspiring messages, for other young people. 3375 Who is your hero? Jewalle WOW… I can’t pick one so I’ll tell you two. My Grandmother and my Mother is my hero’s. My grandmother is an educator on life and has a really good head on her shoulders. She teaches me to give back and also how to save for a rainy day. We have Cancers and Chronic Asthma disease that run in our family, so she encourages me to go visit patients and also participate in fundraisers. She keeps me well rounded as an individual as well, making sure I am exposed to a lot of things other kids my age aren't. My mother simple because of her love and devotion she has for me and my siblings, she strives to be and do the best. She displays great morals and values. My mother is my grandmother’s daughter, a generation of blessed women in my life. 3375 Tell us about your influences, who do you listen to, emulate? Jewalle Kim Burrell, Oprah Winfrey even though she’s not a singer she still influences me in many other ways, Aaliyah, Monica, Missy Elliot and Kandi Burruss just a few to name. I like the way they conduct their business, and how they provided a positive message with their music and or acting. I try not to emulate anyone, only because I want to be original. 3375 What is life like where you live for an up and coming music artist? Jewalle They need a place here where teens can perform. 3375 How do you balance school, music and all the rest at the same time? Jewalle I meditate a lot and try to think good thoughts all the time. I like to remember that God is in my heart and guiding me through any obstacles that may come my way and at the same time giving me guidance in my education and career. 3375 What do you do to relax? Jewalle I listen to soft mediation and gospel music, but ultimately prayer relaxes me in every situation. 3375 How important are your friends in this process? Jewalle My friends are very important… They help to critique new ideas. 3375 How did you like the studio experience? Jewalle The studio being the one place I can go to express myself. If I get frustrated I can vent through my music. The studio is also a great place for networking opportunities and a chance to meet other talented artist. 3375 Tell us a little about the process and all the folks that have helped. Jewalle After school I do my home work, help out around the house, whatever time is left I start writing new music and building my fan base. I receive a lot of guidance from Pro and Hostlye Whosane who provide me with any information I require. 3375 What’s next for you? 3375 Where online can we find update? Jewalle Well before my shout outs I always have to give honor where honor is due to my Lord and Savior Jesus Christ…. Now with my shout outs….... Most definitely shout out to my mother Christina Wright, Pro da ‘Icon “The Game Changer” http://www.datpiff.com/PRO-Icon-mixtape.436758.html , my family and fans. I would also like to shout out Leomenza, Sandy Hudson CEO of Gutta Magazine, Ty Staz, Jay Will, Hostyle Whosane and No Limit Larry & The Morning Show Madhouse…. And last but not least shout out to Jay Mr. 3375 CEO of Ryde4mine.